Welcome once again to our little blog, unfortunately this is our final part in the tea series (but there will be many more blogs to read in the upcoming weeks). This week we learn about the last few teas on offer at T & Thistle, whilst also learning about the legend of Scottish and Breakfast tea. Sit back, relax, and enjoy your chosen cuppa. Ceylon tea comes from Sri Lanka (previously known as Ceylon in the 1970’s) and has a mild citrus taste. Ceylon tea contains potassium, which supports a healthy heart and can aid in reducing blood pressure. Another, more cosmetic benefit of Ceylon tea is that it can help protect the skin against UV rays and help keep collagen levels up, giving you a younger and bouncier complexion. This tea will be a particular favourite for the females reading this, as rose has been known to help ease menstrual pain, whilst also balancing stress hormones. The petals are high in vitamins A, C and E, which help hydrate and tighten the skin, and also support the production of collagen, so like our Ceylon, is perfect for hair and skin health! Drink this one when you’re feeling a little run down. Our final tea on the menu is the one with the legend. In the 1700’s, Queen Anne popularised drinking tea at breakfast when she asked for something other than ale to drink with her heavy meaty meal. However, in 1892, Drysdale saw a need for a stronger blend of tea to match the breakfast, hence, Breakfast tea. Queen Victoria, after visiting Scotland, enjoyed this strong blend of Breakfast tea and took it back with her to England, and controversially the name changed to English Breakfast. So, your English Breakfast tea is actually Scottish (dun dun dun...) Our Highland Chai is a mixture of strong black tea, herbal and chai, BUT we have limited supplies so hurry in store before it’s all gone! Thank you for following our little tea journey, and we do hope you’ve enjoyed it and learnt something new about the teas you’re drinking with us in T & Thistle. Please stay tuned for more blogs about products we have in store, any events we have coming up or previously held, and anything else related to tea, Scotland and yummy snacks! 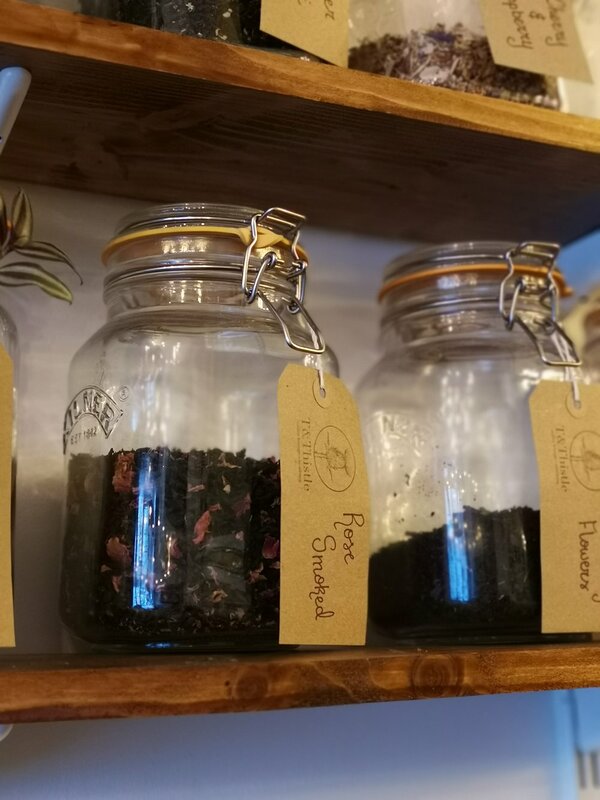 In our last post, we told you all about the difference between black tea and green tea, and gave you some interesting facts about some of the teas we have on offer at T&Thistle. In today’s post, part 2 of our mini tea series, we will be giving more exciting information about the teas we have available in store. We learnt some little facts about green tea in the last week, but here are some things you might not have known about our gunpowder green. The dried leaves are rolled into little balls to resemble gunpowder pellets, hence the name. This shape helps preserve the smoky flavour and aroma of the tea. It also has some health benefits, helping the metabolism, reducing cholesterol, and the caffeine helps awareness and focus. Rooibos, otherwise known as red bush, is a South African herbal tea (but is consumed like black tea). The fermentation process gives it its famous red tones, and is naturally caffeine free. Studies suggest consuming rooibos have antidiabetic effects, and the lack of oxalic acid is beneficial for people who suffer with kidney problems, such as kidney stones. It has also been found that this particular tea is good for controlling spots and eczema. The origin of herbal tea comes from Ancient Egypt and Ancient China, as it was thought they had medicinal properties (plus they tasted great!). Herbal tea doesn’t contain tea leaves, just herbs, flowers or roots, but it is brewed in the same way. Our cherry and raspberry tea contains the mallow flower, just like our Earl Grey, which is good for coughs and tummy complaints, and overall, herbal tea is a great home remedy for bloating and indigestion. Drink like an Egyptian! Chai is based on masala chai, a tea originating from India containing black tea mixed with aromatic herbs and spices such as cinnamon, cardamom, cloves and pepper. ‘Chai’ translates to ‘tea’, and the black pepper and ginger in this tea help aid digestion, with the ginger also very beneficial towards alleviating nausea as it contains gingerol and shogaol, an anti-inflammatory, which also helps soothe headaches. Just one more post left in our tea series with information on the last few teas we have to offer, plus an interesting legend behind Breakfast tea and Scottish tea. Don’t forget to follow us on social media, and let us know what you think when you come to visit us. The difference between black tea and green tea is that black tea undergoes fermentation, whereas green tea is unprocessed. It’s that simple. They’re the same Camellia Sinesis leaf, but fermentation changes the flavours and colours of the leaf, creating black tea. Other factors such as climate and soil can affect the leaf’s flavour, hence different flavoured teas. Both green and black tea’s main health benefit are antioxidants, a chemical which can help stop or limit cell damage, and therefore have beneficial effects on the ageing process (appearance, diseases, etc). 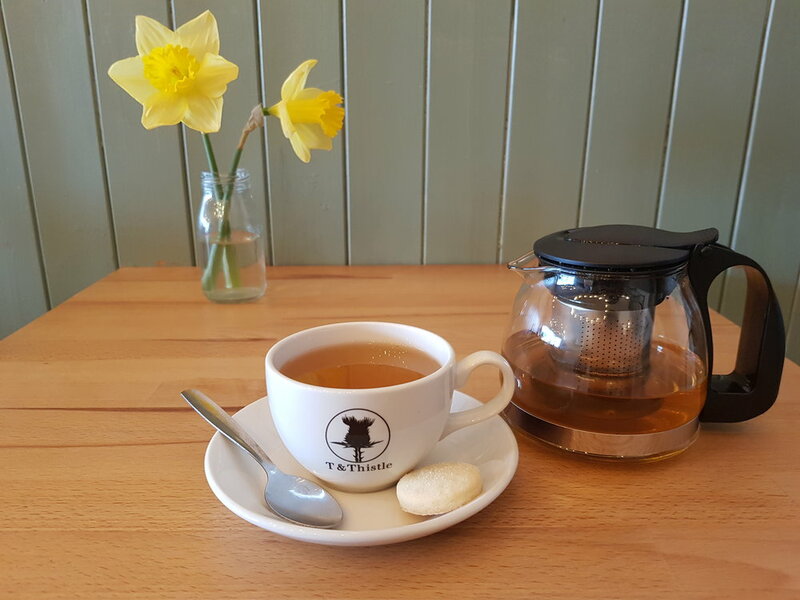 We like use loose leaf tea from The Wee Tea Company in our shop, a tea blender based in Dunfermline, Scotland. Using loose leaf tea gives the tea space to expand, allowing maximum flavour and very satisfied tea drinkers. A classic. English Breakfast is a black tea blend of Assam (North East India), Ceylon (Sri Lanka) and Kenyan (East Africa) teas. Studies have found that this tea can help lower cholesterol, and therefore lower the risk of heart disease. Pop in for a cup of your old favourite. It’s the beginning of the year, so not only are we stressed about being back at work, but we’re also fighting a cold. Earl grey tea contains an oil from a bergamot orange, which is said to have a calming effect on people, plus it’s a natural cold remedy. But our earl grey has the added bonus of the blue mallow flower, which has been known to help ease coughs and tummy complaints. We all know that feeling of overindulging but we just can’t help it when it comes to delicious food. Well, if you have eaten too much cake when visiting us, a cup of peppermint tea will ease the bloating and tummy aches. And that cold sensation you experience is the menthol within the peppermint. It activates the cold sensing nerves and makes that part of the body feel cold (plus this one’s another cold remedy). Part 2 will go through more of our remarkable teas, including the new popular trend of chai. 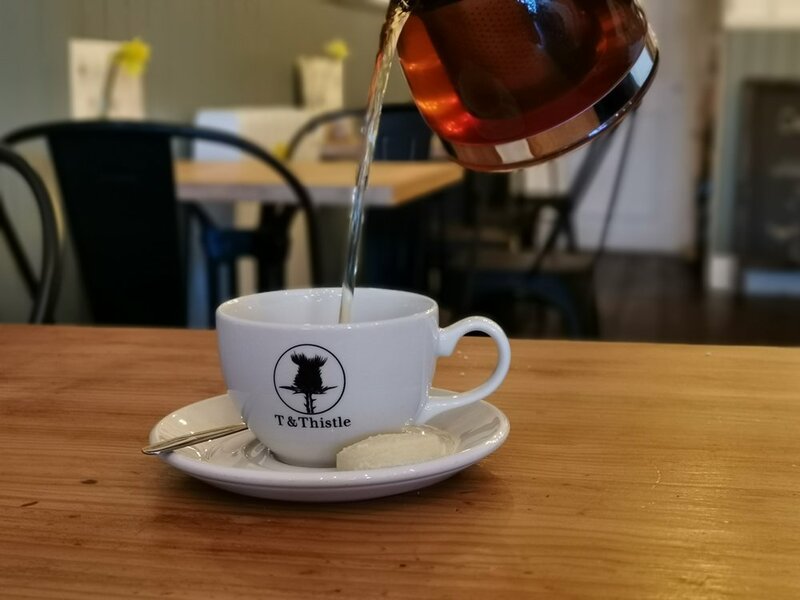 Let us know what you think of our teas when you come to visit T&Thistle, and don’t forget to follow us on social media to be the first to know about everything coming up this year. We very much appreciate your feedback, whether it is positive or whether it is areas you feel we can improve upon. Feel free to chat to us in person, but if you can't make it in please do email us or contact us on Facebook, Instagram, Twitter or Trip Advisor. © Copyright T & Thistle 2016. All Rights Reserved.